“After the walk, it took me a while to note certain fundamental changes had taken place in my habits and ways of thinking. For instance after 5 months of not sitting in a car I never found the option of car travel very attractive again. My annual mileage has fallen to 2- 3000 miles a year and that includes some essential use for work. In daily life I try to either walk or cycle journeys because I really want to be outdoors, enjoy the physical movement and exercise . I also try to use public transport as I prefer many things that this offers in terms of exercise, adventure and the abilty to use the travelling time for reading etc. Car travel for me is not the quality choice. I actually returned to complete gaps from the 2013 walk. 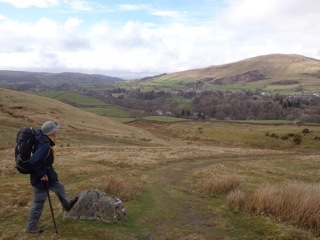 So in 2014 and 2015 I walked another 350 miles so that finally my whole route around Britain had been done on foot, making it a complete continuous walk was important to me if not entirely logical. When it comes to holiday planning I tend to find myself thinking of walking holidays as the most relaxing option. e.g. To keep me in touch with my young adult children we have started the South West Coast Path – walking it in stages. 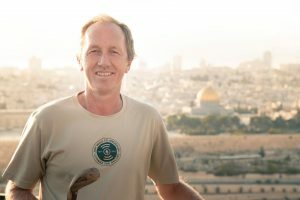 This was a prelude to joining “Just Walk to Jerusalem” – Organised by the Amos Trust , a walk from London across Europe to the Holy land for equal rights in Israel / Palestine to mark the centenary of the Balfour Declaration ….As soon as I was sent a link I knew I had to join it . So I negotiated a career break even though it was a difficult time at work with re-structuring of the planning service. I joined over 100 others and 9 of us made the 2000 mile journey across Europe with a final huge reception in Palestine. My previous experience did give me a certain inner confidence in completing the walk, although the dynamics were very different from the more personal nature of the 2013 walk. It really opened my eyes to injustices that I was poorly informed about. I also kept a weekly blog of the journey. This entry was posted in Adventurer and tagged British Pilgrimage, Just Walk on February 21, 2014 by admin_TW.